Breaking away from the typical college cuisine, Cardinal Nutrition offers healthy substitutes that are otherwise scarce on campus. 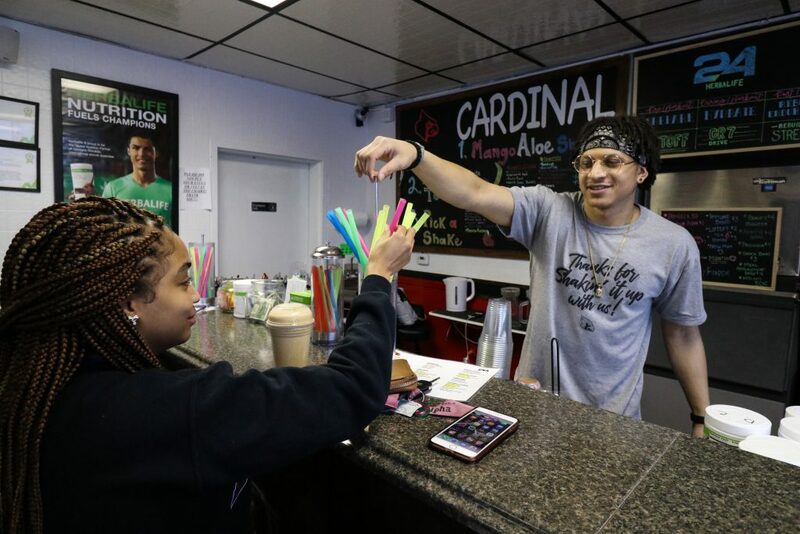 Their mission is to make Louisville healthier one shake at a time. When customers initially enter Cardinal Nutrition, they are greeted by a wellness coach that starts them out on a three step process. First a mango aloe shooter is offered, which is good for the digestive system. Next, customers will be given an herbal tea that helps boost the metabolism. There are three flavors to choose from: raspberry, lemon and peach. Finally, guests will be handed their shake. There are a wide variety of flavors. If someone can think of any random flavor it is probably on the menu. Some of the flavors include strawberry shortcake, pineapple upside-down cake, captain crunch, snickers, nutter butter and coconut crush. Shakes are 200 to 300 calories with 25 grams of soy isolate protein, 21 grams of key vitamins and minerals, while also being sugar and gluten free and vegan friendly. The shakes also serve as a meal replacement so customers can expect to be full from three to four hours off of one shake. Cardinal Nutrition relies heavily on students for business and is focused on this core demographic. The atmosphere is laid-back and relaxed compared to the hustle and bustle of campus. “We have really been getting a lot of support from the students and without them there would be no us,” Miner said. As customers leave Cardinal Nutrition, it is customary to be thanked for shaking it up. I would be interested in your opinion about it. Thank you. Good blog! Too bad Herbalife is a pyramid scheme.